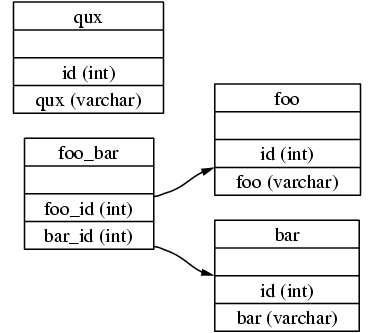 A simple tool to produce an entity relationship diagram from a SQL file of table definitions. It is fairly primitive, often requiring a touch up of the input file manually, but still quite useful to see dependencies. CreateTable => "create"/i Space "table"/i Space TableName Space? "(" ColumnDefList? ")" ";"
ColumnDef => ColName Space ColType (Space Reference)? Reference => "references"/i TableName "(" ColName ")"
The output is in a format suitable for GraphViz's dot tool. To make any use of the tool, you'll need GraphViz. SQLGraph is written in Java so you'll need a recent JDK to compile it from the source, and at least a recent JRE to run it from the JAR file below.